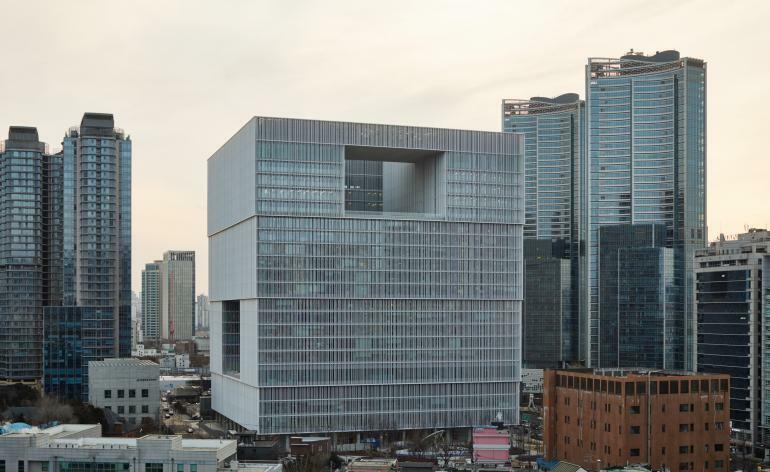 Korean beauty brand Amorepacific has a monumental new HQ in Seoul’s Yongsan district. Designed by David Chipperfield Architects, the glazed cube is punctuated by voids that reveal an internal courtyard. As well as offices, a restaurant, a library and more, it houses the Amorepacific Museum of Art. Chipperfield’s geometric precision set the template for the wayfinding graphics, by Sascha Lobe, a Pentagram partner since June. Lobe’s graphic interface with architecture (and his work on this project) began at L2M3, the Stuttgart studio he co-founded in 1999 and which worked on cultural institutions including Chipperfield’s Kunsthaus Zürich extension. ‘I try to find the right solution for every architecture, brand and function,’ he says. In Seoul, the award-winning signage, that just won Best Way to Go in the Wallpaper* Design Awards, was shaped by architecture and context. ‘A cube is a challenge for orientation because the symmetry of the building prevails,’ he says. ‘Our solution was to link the building’s wings with its spatial context.’ The four distinct views from within – the Namsan Mountain, Yongsan Park, the Seoul skyline and the Hangang River – create a matrix to orient visitors, rendered as a sparse, elegant pictogram.